You can never have too many Nanos. Especially if you’re the type to litter the mountain with biners. 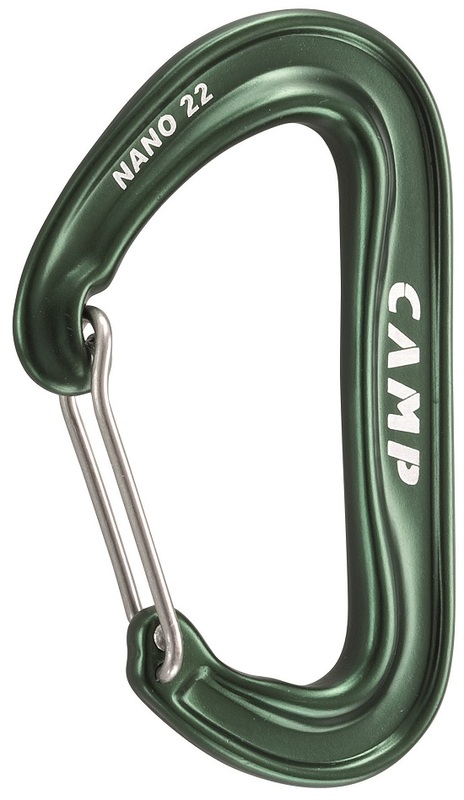 The 22 is a revamped version of the classic CAMP Nano carabiner, which set the standard for lightweight functionality. 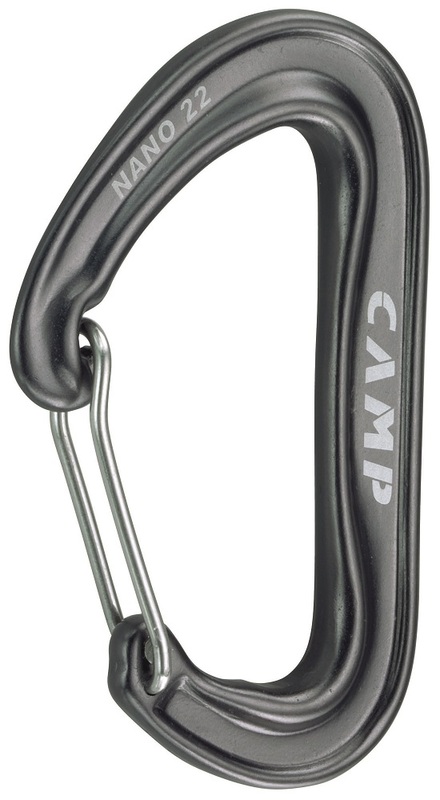 The new version has a refined gate for easier clipping and a deeper basket for holding the rope position. CAMP also managed to increase the open-gate strength while subtracting a gram. The biggest little biner on the market comes in eight colors for your sorting and racking pleasure. Wide gate opening helps slot your rope or anchor while wearing gloves. Inner space is large enough for a clove hitch using any rope. Profiled nose can slip into tight chain links or harness loops. Weighs just 22 grams, which had a big influence on the name. Bottom Line One of the smallest carabiners compatible with any diameter of rope. In my opinion the best wiregate currently on the market. Very light, small but the gate opens to a reasonable width, and the nose is very small profile. They do like to snag on the floss line gear loops of skimo harnesses but I think its worth the weight savings. One downside: the low price is reflected in a lack of quality control, if you buy a few rackpacks worth you inevitably get a few with sticky gates.  I love camp Nanos!! I have quite a few on my rack and am always looking for good prices on more! It is surprisingly large for its weight. It is very thin so I always double check that I don't have any bending forces on it when its weighted. I use these for alpine draws and it is harder to clip the rope but I think the weight savings are worth it in the alpine. I also use them for all of my crevasse rescue gear that doesn't require a locker. These and Metolius FS Minis are my go-to lightweight climbing biners these days. The Nano is a touch lighter than the FS mini while also being bigger and easier to clip/unclip. I pare down my rack to single nanos + 8mm dyneema slings in the smallest quantity I can get away with for big alpine stuff. The weight and bulk reduction really adds up. Neat that they come in colors now - maybe soon it will be time to upgrade my racking biners!